New! 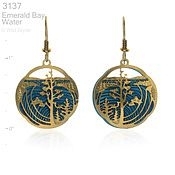 Our exquisite Tahoe Emerald Bay Earrings feature a brilliant blue Paua Shell backing. Simply dazzling! We have sold out of the gold-plated style, but these earrings are still available in a rhodium (silver) finish with sterling silver earwires.